PSG star Neymar believes the Serie A will be a league to watch once again after Cristiano Ronaldo’s move. Juventus have pulled off one of the best transfers for this summer. Real Madrid and Ronaldo weren’t on good terms, as the latter once again demanded higher wages for the third consecutive summer – demands which weren’t met by Florentino Perez. Manchester United seemed to be the most likely destination for the Portuguese star, but Jose Mourinho passed on the opportunity. The Bianconeri then swooped in and sealed the deal for a reported fee of €112 million, and more than half of this amount has already been recovered by Juve through Ronaldo’s jersey sale. Ronaldo’s move to Juventus shocked a number of football fans, as they expected him to retire at the Bernabeu. Neymar also had his say on this switch, stating how the 33-year-old will revolutionize Italian football and make it worth watching again. The former Barcelona forward is known to be a huge fan of Cristiano. 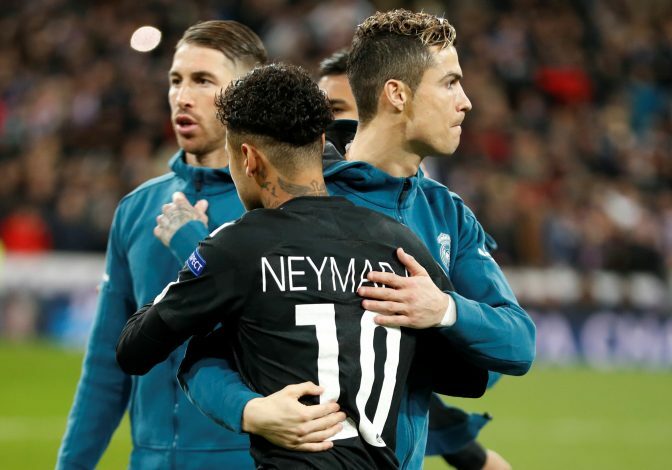 Neymar further revealed that he was happy that the Portuguese star decided to join Juventus and wished him luck, but not when he plays against Paris Saint-Germain. “He is a legend in football, a genius. I’m happy for his decision. I think it is a difficult decision for him so I wish him good luck, but not against Paris,” the 26-year-old added. Meanwhile, Real Madrid continue to search for a Galactico signing who could replace Ronaldo this summer. Reports suggested that Neymar, Eden Hazard, and Kylian Mbappe were on the shortlist. But with the former now dropping off the radar, Hazard seems to be the likeliest candidate to join Los Blancos. World Cup Golden Boy Mbappe is a possibility, although he did join PSG on a permanent deal only recently.